Most of the kids playing in the 2000 Delaware State High School Golf Championships at Shawnee Country Club in Milford had never played the course before, and therefore had no inkling of what the 448-yard 18th hole was going to do to their scores. Among the regular players at Shawnee, the par-four 18th routinely ranks as the toughest hole on the course. It’s long and straight, with steep-faced fairway bunkers ready to catch errant shots that miss the fairway right or left. Thick stands of tall trees flank the last 150 yards to the green, making a recovery from a sliced or hooked approach next to impossible. The only saving grace about the hole is that it runs with the prevailing westerly winds. During the first round of the 2000 championships, however, the wind came out of the east, blowing directly into the players’ faces at a stiff 20 knots. High school golfers nowadays tend to bomb their way through most courses, but not this time. It was not at all unusual to see kids hitting driver, then driver again, then wedge, fighting the hole and the wind to try to reach the green in three for a maybe-one-putt par. Most were unsuccessful, and were often seen shaking their heads as they dejectedly left the last hole of the day. 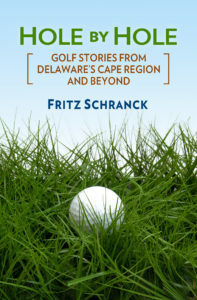 Somehow Shawnee’s 18th didn’t make it into Chris Millard’s interesting new book, Golf’s 100 Toughest Holes (Abrams; $45 SRP). Based on the blistering comments I heard that day, the kids would have strongly suggested that Millard was off by at least one hole. 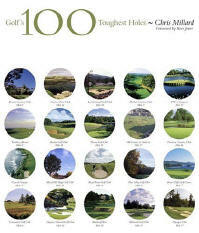 As Millard readily admits, however, anyone’s list of the 100 toughest golf holes is bound to differ from anyone else’s. There are several hundred thousand golf holes to choose from, after all. There are some famously difficult holes on which many golfers could agree, but among the vast number of relatively anonymous golf courses there are thousands of tough holes facing their players. It’s to Millard’s credit that he made sure that some of these lesser-known courses were represented in his list, even as he paid homage to the well-known hard-to-play holes. For example, the West Course at Winged Foot Golf Club in New York is the scene for next year’s U.S. Open, and Millard includes its famous 18th hole in the book. Millard also gives a very good explanation for including the far less well-known 6th hole at Quaker Ridge Golf Club, just down the street from Winged Foot. A.W. Tillinghast fit a 443-yard test on sloping, tight fairways, with a small green and deep greenside bunkers. Quaker Ridge has hosted the Walker Cup competition, which should confirm Millard’s assessment for most avid golfers. I’ve only played two of the holes on Millard’s list, and I can easily agree with his decision to include them. I played the 8th and 9th holes at Pebble Beach in three-over par, doubling the 8th and bogeying the 9th. With my 17 handicap, I was pleased to do that well on these two. On several other holes Millard describes, limiting my score to triple bogey seems like a more realistic goal. I saw the 12th and 15th holes at Bethpage State Park’s Black Course during the 2002 U.S. Open, and was simply awestruck at how difficult these two holes looked. They’re in this book, and I don’t believe most golfers would disagree. Millard also includes some unusual holes in this well-illustrated coffee table book, such as the 192 yard par-3 that constitutes the only golf hole at Camp Bonifas, in the Korean Demilitarized Zone. It is surely the only golf “course” with real land mines, instead of those of the figuratively-speaking variety with which most golfers are familiar. It’s possible that reading this book straight through could cause some despair, as one mentally compares one’s golfing skills to the challenges presented by Millard’s collection. While I doubt that golfers as a group are any more masochistic than any other group of humans, I also believe that most golfers truly appreciate the test of skills that these holes present.